Available Color Surfmist,Headland,Pale Eucalypt,Cottage Green,Aquamarine,Sky Blue,Torres Blue,Toba Blue,etc. LYSAGHT ®FLEX-LOK 400 Roofing Sheets system is a standing seam roofing system. This architectural profile has an effective width of 400 mm, standing seam height of 65 mm and 3 stiffeners symmetrically spaced between ribs. The profile is available in tapered and curved shapes to meet the most challenging design conditions. The LYSAGHT® FLEX-LOK™ 400 is a concealed fixed and mechanically field seamed profile which assures the dual benefits of increased weather durability and greater resistance to wind uplift. 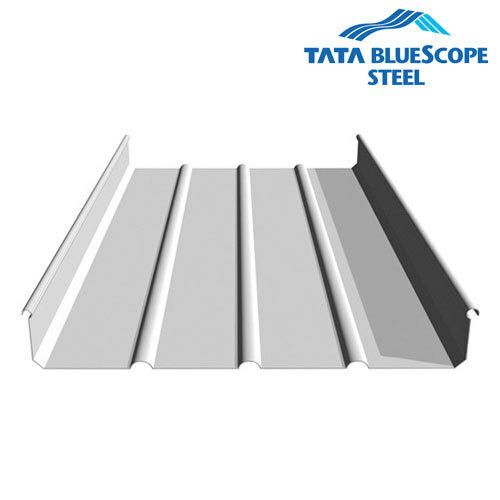 Tata BlueScope Steel maintains high standards in the area of Safety, Health and Environment and has been certified by Underwriters Laboratory Inc. for ISO 9001: 2008 as well as by M/s. UL MSS India for the ISO 14001 & OHSAS 18001 certifications.